How can I download & transfer an eBook from Kindle or www.amazon.com to PC? I have the Kindle for PC and Kindle for Android apps. I can't find an option to do it in the apps. For the web browser on www.amazon.com, under Account > (Manage) Your Content and Devices, clicking the Download & transfer via USB action for the eBook brings up the below prompt. The options in the drop down menu are the aforementioned apps, neither of which are selectable. 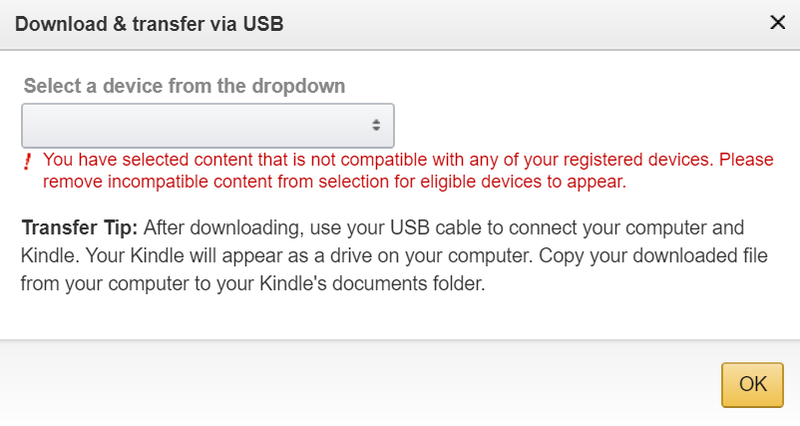 Must I possess Kindle or Fire hardware to enable the download option? I don't know the PROPER answer but I can think of a workaround. Use a memory stick. As it's in the USB socket, the system SHOULD say 'Ah. There's something in the socket for me to put the file onto' and just do it, then you can move it back off the stick onto the computer. If you've got a smart phone, you should be able to use that. Connect up the smart phone, which'll likely show up as disc drive, put it on smart phone, move it from smart phone to PC. It's not a very good answer. If anyone knows how to do it directly I, too, would love to read how! Right now it's the only way I know to do it, too! Not the answer you're looking for? Browse other questions tagged kindle amazon android download kindle-pc-reader or ask your own question. How to download from Amazon cloud to Kindle desktop?